The Hominidae form a taxonomic family of primates, including four extant genera: chimpanzees and bonobos (Pan), gorillas (Gorilla), humans (Homo), and orangutans (Pongo). 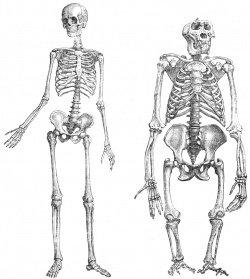 Two more genera is nowadays extinct: Australopithecus and Gigantopithecus. Speculative evolutionary diagram of Hominidae phylogeny based on the interpretation of skeletal remains. This page was last modified on 21 May 2016, at 07:17.